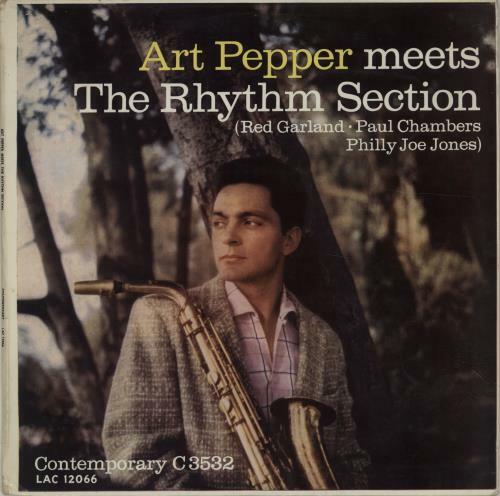 ART PEPPER Meets The Rhythm Section (Classic 1957 first UK issue 9-track mono LP where Art 'borrows' the incredible rhythm section of Miles Davis - At the time, even Miles said; 'I have the best rhythm section in the world' - Red Garland on piano, Paul Chambers on bass & Philly Joe Jones on drums. This is an advance issue with rough textured lime green stock labels & a 'Sample Copy - Not For Sale' stamp on the Side 2 label for review before release. 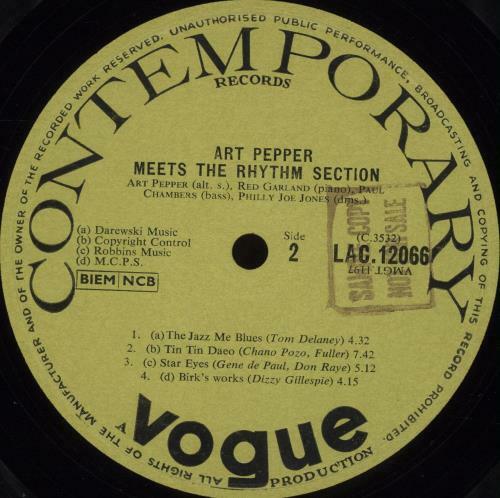 This copy originates from the private collection of a former staff member for Dobells record shop in Charing Cross. The laminated flipback picture sleeve shows just a little corner creasing & scuffing with all text clear & the colours look rich & vivid. The heavyweight vinyl is clean & grades Excellent with minimal signs of play LAC12066).